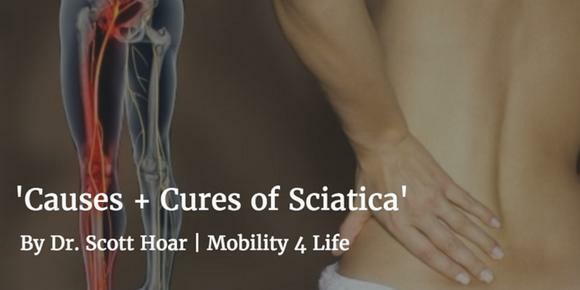 What is sciatica, what causes it, and whats the cure. It occurs for a variety of reasons but what they all have in common is irritation of the nerves in the lower back or hip. Unfortunately, with sciatica, the nerves tend to be very inflamed and since the nerve is the pain source, it can take a long time to recover. Think of how long it took Peyton Manning to recover from his surgery impacting the nerves in his neck (and he had the best medical treatments available to him every day). It's always recommended to start with non-weight bearing exercises in pain-free versions. You might not be able to perform the following exercises to full range of motion. That's okay, just work with the pain-free range for now. This is a good exercise to attempt to use. Sometimes if you're in sciatica type pain you can activate your core (as shown in the video) by squeezing your hands down on the floor then raise the leg up into the air. If that helps to decrease your pain, then that's your exercise. This is also a good one especially if you typically have limited flexibility in the hips and hamstrings. It's also a good idea to consider limiting your sitting as much as possible. Lots of people flare up their sciatic symptoms while sitting for extended periods of time. The physical pressure that occurs of the sciatic nerve contributes to its inflammation and pain. Take a brisk walk every hour and limit your sitting. In the evening while watching tv or reading, consider laying down on your belly instead of the couch. The extended positioning of the hips will help decrease stress on your lower back and hips. Sciatica can get dangerous if you're ever experiencing what we call a 'foot drop' or weakness of the foot that might lead to tripping or losing your balance. Typically that will result in a consultation with a surgeon because it involves considerable risk. In the absence of that sign, I recommend conservative treatment methods such as chiropractic, physical therapy, acupuncture, etc. If you have bad sciatica, please present for professional treatment. This is in no way a complete medical recommendation but hopefully, helps you steer clear of the condition. Good luck!